Headphones on my belly instead of my ears as I relax on a rocking chair while reading a book. When I was pregnant with Nikola, I came across many articles that scientifically support music as a great way to enhance a child's mental growth development. So everyday, I would randomly play classical music on my headphones for her. When they begin to develop their own taste, it might be more difficult to shove your own choice of music down their throats. So what I do is just play it in the background at our entire house. Why? Because it really works! especially when she needs to study for a test. With the right music, she absorbs and remembers everything like a sponge AND in a more calm an relaxed fashion. I may not be into scientific mumbo jumbo...(yawnn) but from my own personal experience, I can also attest to the fact that the right music can help you concentrate and perform better. Whenever I have trouble writing an article, I just put on some classical music, wait a few minutes, relax and next thing you know, the words just begin flowing out of my brain and onto my keyboard. When I have trouble sleeping, same thing. There is a right kind of music for every need and thanks to Progress Pre-School Gold, we can now stream the right melodies for our children via Spotify for FREE! 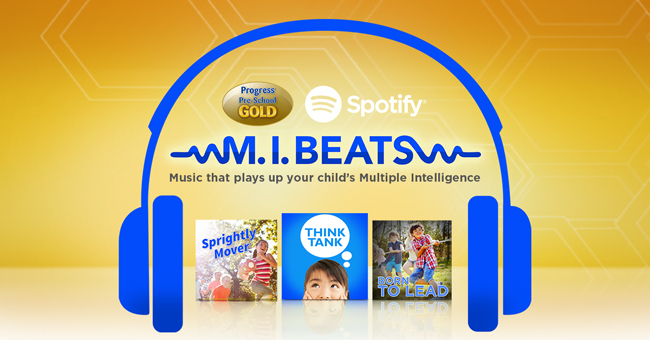 Dr. Inciong and Teacher Marah have partnered with Progress Pre-School Gold to create the first ever playlists, based on scientific research and practical applications, designed to help build Multiple Intelligence in the Philippines. To support Brain smarts, the team chose songs that highlight linguistic development through vocabulary building, phonemic awareness and vocal development as a way to develop oral language and speak rhythmically and expressively. For Body Smarts, song selections were anchored on music that can potentially help develop fine and gross motor skills and for People Smarts, songs focus on showing kids how to express their appreciation for friends and practicing basic social skills such as cooperation. HOW TO ACCESS THE M.I. BEATS PLAYLIST? For every 1.6kg can of Progress Pre-School Gold, you get FREE access to the exclusive M.I. Beats Playlist on Spotify Premium for an entire month. Simply purchase the specially-marked cans to get the unique code, go on www.multipleintelligence.com.ph to register, then wait for the confirmation email. LOL at "Baby Einsteins, Little Einsteins then One Direction" - I can see this coming with my 4-year old girl! Like the One Direction you said there, hihihi. Same here. We play a lot of classical music at the small house. And my four-month old boy sleeps well with music on the background. I let my daughter listen to classical music when she was in my womb. This is a great idea! My twins love music! When they watch movies it should have music kasi pag wala they are not interested. This is wonderful. I used to play classical music when my boys where much younger. I swear by the positive effects music has on both my boys. This is nice! Too bad though that my kids are picky when it comes to their milk. We also play classical music here at home! We alternate it with "word songs" that enhance my kid's vocab. that's nice! like the classical songs from the princess movies? Same as you, I put headphones on my tummy when I was pregnant with my son. And now he likes Baby Einstein.